Amped Software has released the order form for their training session in Ft. Worth, Tx. 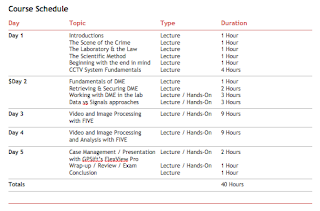 Intermediate Forensic Multimedia Analysis with Amped FIVE Professional is being presented in Ft. Worth, Tx (home of the #1 downtown in the US in 2014), May 5-9, 2014. Click here to check out the Gendarmerie on FranceTV using Amped FIVE to calculate the height of suspects (begins about 17:00). How cool is that?! Expectations and Goals: Graduates will acquire intermediate level training in the techniques and skills necessary to perform examinations, clarifications, and analyses on digital multimedia evidence in a “forensic science” setting as well as to package, deliver, and present those findings in their local court room context. Sponsors: Amped Software North America and GP SIFT. Skill Level: Intermediate. 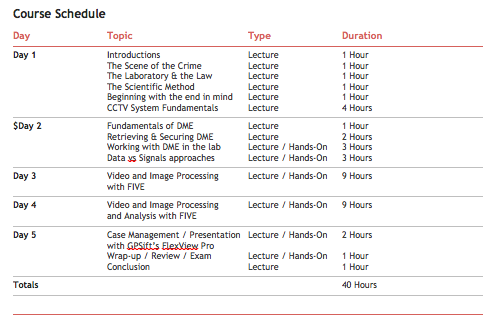 It is assumed that the student will have a basic knowledge of Forensic Multimedia Analysis and be able to navigate comfortably within the Windows computer environment. While the registration page is being put together, click here to send your contact information to Amped Software. The registration page should be up in a few days and will contain information about the venue, host agency, costs, and hotel recommendations. I just wanted to get the word out about the opportunity as quick as possible. Also, you'll note that the class is oriented towards a Friday travel day with an afternoon departure time. Please consider taking a few minutes on March 28th to participate in the LEEDIR Operational Test! How: Simply upload a random 1-3 minute video or still images shot with your cell phone. The video can be of anything, but we encourage video of people in public places, malls, shopping centers, convenience stores, vehicle traffic, etc. The LEEDIR Eyewitness Platform INVITES YOUR PARTICIPATION! or the Android app (available March 23rd at the Google Play Store). As submissions are uploaded, investigators at the LASD Cyber Investigations Center (CIC) will review, manage, analyze and distribute the photos and videos as they would during a real major emergency event, to better inform their emergency response teams and gather evidence. During the event, analytics and statistics will be published, followed by a press conference at SHB to broadcast the results. 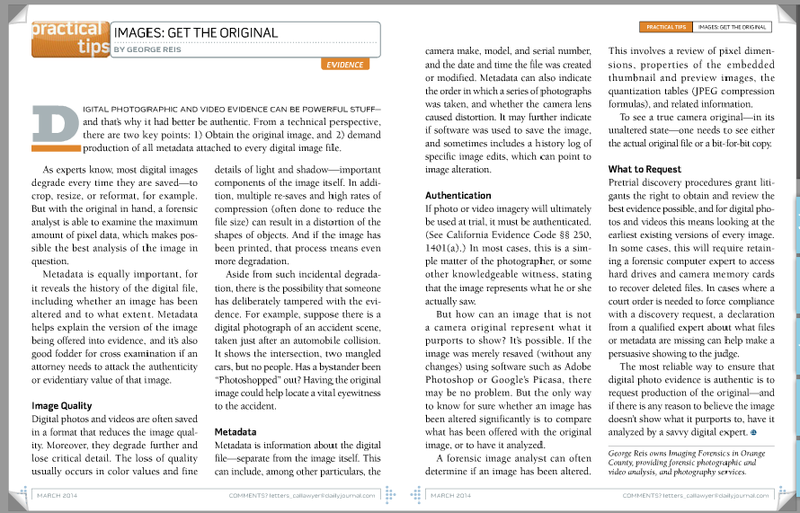 This just in from George Reis, "The March 2014 issue of California Lawyer magazine includes an article I wrote, titled, "Images: Get the Original." The original version I submitted had to go through quite a bit of editing (I wrote it before checking for length requirements, so it was too long). The points I tried to make are that when an attorney is provided with photographs or video evidence from opposing counsel, the best evidence is a bit-for-bit copy of the original, in it's original format. 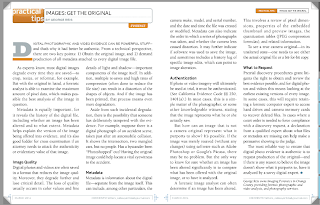 And, that when providing images to opposing counsel, providing bit-for-bit copies of the originals can result in fewer claims of file manipulation. The article is on page 24 of the on-line edition (link) and page 13 of the printed version." Cell phone with a camera, or camera with a phone? John Riddell's Data Recovery Blog poses this curious question, how do you view your mobile device and how to you maintain it? "With the increasing popularity of built in cameras with our cell phones today, it’s no longer a question as to whether you’ll use it at all but how often you’ll use it. It seems as though there is as much emphasis on the cameras in the phones today as there is memory, battery length and amount of apps we can store. I recently saw a TV commercial for a phone with a camera and the only thing they talked about were the features of the camera, nothing else." That being said, how are you processing video/image evidence retrieved from mobile devices? Do you have the ability to safely acquire the images? Do you use your own iTunes account? With the cost of "forensic" software being relatively high, folks are "just doing what they can" to get images from phones and tablets. Some are even e-mailing images off the evidence to their own e-mail account. Whatever you are doing, have a sound policy / practice document … and follow it. This just in, "Computer scientists at Michigan State University have built the first three-dimensional model of a human fingerprint. They say it will not only help today’s fingerprint matching technology do its job better, but could eventually lead to improvements in security. The method, developed by Anil Jain, his MSU colleagues and research collaborator Nick Paulter at the National Institute of Standards and Technology, takes a two dimensional image of a fingerprint and maps it to a 3-D finger surface. The 3-D finger surface, complete with all the ridges and valleys that make up the human fingerprint, is then made using a 3-D printer. It creates what Jain’s team called a fingerprint "phantom." They say that tools like this would help improve the overall accuracy of fingerprint matching systems, which eventually leads to better security in applications ranging from law enforcement to mobile phone unlock." 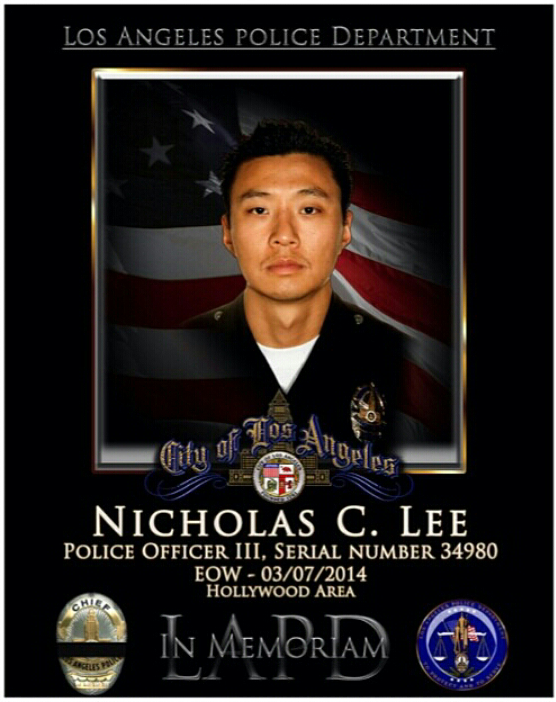 LAPD Police Officer III Nicholas Lee, Serial No. 34980. A man of greatness and selflessness. 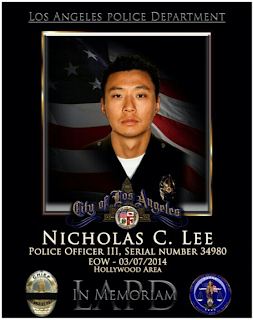 Nick was a great cop. "We just released an update to FIVE with a lot of improvements, bug corrections and customer requested features. Imagine how useful it is the combination of these features: you can show and explain step by step in a document or presentation, all the operations done with FIVE." It's amazing to have a company respond to suggestions by implementing changes in such a speedy fashion. For those agencies with pre-made report templates in MS Word, or who use MS PowerPoint extensively, this is a huge time saver.